Philips Hue White Starter Kit -aloituspaketilla voit luoda muokatun valaistuksen kotiisi lähes mistä tahansa. Voit ohjata Hue White -valaistusjärjestelmää langattomasti iPhonella, iPadilla tai iPod touchilla. Sinun tarvitsee vain ladata Philips Hue -ohjelma ja luoda hetkeen tai mielialaasi sopivia yksilöllisiä valaistusasetuksia. Aloituspaketti sisältää kaksi Hue-lamppua ja Hue Bridge -sillan. Liitä Hue Bridge Wi-Fi-verkkoon ja hallitse jopa 50 Hue-lamppua samanaikaisesti Applen iOS-laitteessa olevalla Hue-ohjelmalla. Hue-lamput käyttävät 5 kertaa vähemmän virtaa kuin tavalliset halogeenilamput, joten ne ovat ympäristöystävällinen vaihtoehto. Hallitse valojasi Philips Hue -ohjelman avulla tai lisää järjestelmääsi kytkimiä valojen aktivoimista varten. Aseta esimerkiksi ajastimia, ilmoituksia ja hälytyksiä, niin saat täyden Philips Hue -kokemuksen. Nauti sujuvasta himmennyksestä ilman johtoja, sähköasentajan apua tai asennusta. Hue-ohjelman ajastintoiminnon avulla Philips Hue voi asettaa valot päälle ja pois päältä automaattisesti, ikään kuin olisit kotona tai poissa kotoa. Voit jopa asettaa valot syttymään eri huoneissa eri aikaan. Yhteensopivuus: Edellyttää iOS-versiota 11.0 tai tätä uudempaa versiota. Transform the way you experience light with Philips Hue. The Philips Hue App makes it easy for you to get the most out of your Hue lights and accessories. With the Philips Hue App, you can easily organize your individual lights into rooms. Switch rooms on/off or change the color or brightness of all your lights to match your mood or your activity. It's ea sy to control no matter how many lights you have. Transform your lighting into an extraordinary experience with our color palette. Effortlessly choose from 16 million colors or any shade of white light. Choose from four preset light recipes that support your daily routines: Energize, Concentrate, Read and Relax. Get ready for the day with cool daylight that helps to energize your body and mind. Stay focused with finely tuned bright white light. Or put your feet up and relax with warm white light for the perfect end to the day. Enjoy a sunset in Honolulu or a night out in London's Soho district. Simply tap the scene to transform your room. The Philips Hue App features over 30 scenes handpicked by our lighting designers. Let their expertise help you instantly transform your room. With our state of the art picture-to-light algorithm you can easily transform your favorite picture into a personal Philips Hue scene. The algorithm extracts the relevant colors and intelligently applies them to your lights. Now you can use your Hue lights to relive your memories using your own pictures. Automate your lights any way you want. Start at a specific time or when the sun goes down, turn on and off or activate a scene. You can even mimic being home by randomizing the routine. Set it and forget it. With the App's location awareness feature, your lights will automatically turn on when you arrive at your front door or turn off when you leave home. Configure your lights to help you fall asleep at night and wake up energized. 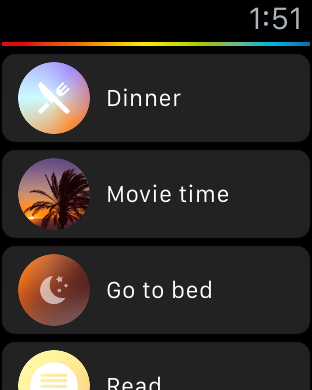 Create your own personal sleep routines to automatically dim the lights in the evening or gently wake you up in the morning. Surprise your guests or simply never struggle again while walking into a dark home with your hands full. Whether you want to turn your lights on and off or change the brightness of a room, a lot can be done using your voice. Explore the possibilities of voice control with the voice assistant of your choice. For quick and easy control of your lights you can use the Android and iOS widget. Setting it up is quick. Using it is even quicker. 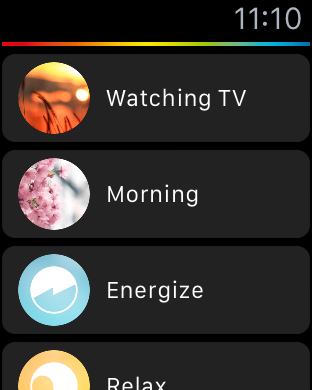 You can also use it to trigger your lights instantly from the device you wear all day on your wrist: the Apple Watch.